Applies a bottom-up perspective based on contextual territorially differentiated case studies. 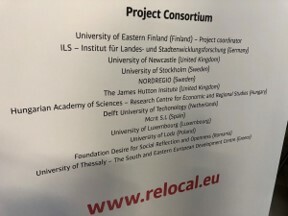 The 4th Project Workshop and the 2nd RELOCAL Project Conference took place in the city of Łódź, Poland, on 5-7th March 2019, hosted by Łódź University and the Regional Development Agency of the Łódzkie voivodeship. Katalin Kolosy from AEIDL took part as a member of the scientific advisory board. In 2017, the RELOCAL researchers selected 33 locality-based/targeted case studies from all over Europe that represent different welfare regimes, rural and urban areas, disadvantaged and better-off localities and various cultural and historical contexts. Fieldwork took place in 2018 and the first draft case study reports became available in 2019. Each individual case is designed to provide a holistic picture of place-based targeted actions and their interaction with the spatial justice context. These interactions are analysed through various dimensions such as (a) promoters and inhibitors, (b) competences and capacities and (c) procedural and distributive justice. The reference to smart villages calls upon the social capital theory of linking, binding and bridging and may concentrate on smart ‘villagers’ instead, avoiding the revival of the old trench war between human geography and spatial planning. Empirical work carried out through these 33 RELOCAL case studies will be synthesized in order to reveal alternative scenarios of future spatial (in)justice in European regions. The consortium agreed to the prospect of compiling all this hi-level quality and detailed documentation into a book to be published at the end of the project cycle (December 2020). There should be more scope for all local development aficionados to further advocate the outcomes of this impressive work in due time.